Artist's illustration of Basilosaurus cetoides copyright © Ezequiel Vera on Flickr (used by permission); see more dinosaur artwork on deviantART. Alabama designated Basilosaurus cetoides (Zeuglodon) as the official state fossil in 1984. Fossil remains of this prehistoric whale were first found in Clarke County about 1833 and later discovered in Choctaw and Washington Counties. A complete skeleton of a basilosaur (which means "king of the lizards") was found on a plantation in southwestern Alabama in 1834 which was determined after study to be a meat - eating member of the whale family, not a lizard. 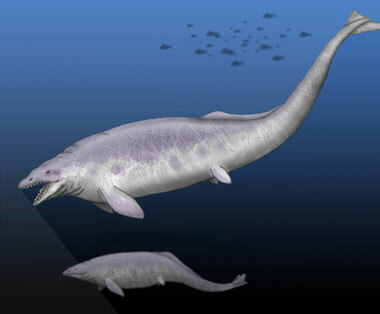 For this reason it was renamed the zeuglodon (Genus Basilosaurus). They estimated this fossil to be over forty - five million years old (Eocene period). Zeuglodons averaged from 55 to 75 feet long with tails up to 40 feet long. These ancient whale fossils are most abundant in Alabama and many zeuglodon skeletons have been found there (fossil remains of Basilosaurus cetoides may not be removed from the state without prior written approval from the governor). 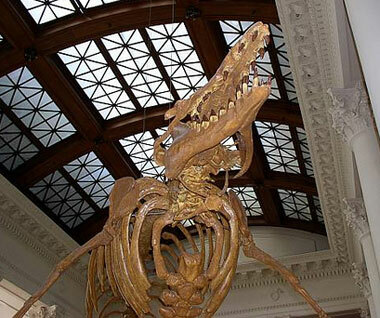 The two most complete Basilosaurus cetoides skeletons ever found are from Alabama - one is displayed at the McWane Center in Birmingham and the other in the Smithsonian Institutute in Washington, DC. Basilosaurus cetoides fossil at the Alabama museum of natural history; photo by Michael Dressler on Flickr (noncommercial use permitted with attribution / no derivative works).